Sometimes these tarts are called galettes. Whether you call them tarts or a galettes, please don’t cover the fruit with pastry or whipped cream. 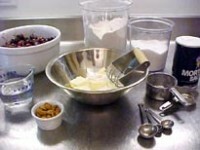 To make the dough, place the flour, salt, sugar in a bowl, cut in the cold butter with a pastry cutter. When the mixture looks like breadcrumbs or oatmeal flakes, add the water and mix with the fingers of one hand to bring into a ball. Knead lightly to get the mixture to come together. Place in wax paper in the fridge to chill for at least 20 minutes. To make the filling, place the sugar, butter, and almonds in an electric food processor and process until smooth. Roll out the dough on a lightly floured surface to about 12 inches around. Cut the dough into 4 rough circles. 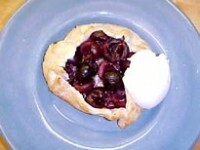 Place a generous tablespoonful of the almond filling on each round of dough and cover generously with the cherries. Sprinkle the cherries with Kirsh. 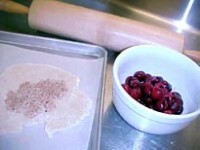 Brush the rim of each round of dough with water, and bring the sides up around the fruit, leaving a window of fruit on the inside. Mix the whole egg in a little bowl with 1 tsp. water and a pinch of salt. Brush the surface of the tarts with the egg glaze, sprinkle the dough and fruit generously with sugar. Bake the tarts on the upper rack of a preheated 375 degree oven for 35 to 45 minutes. Serve with sweetened whipped cream or ice cream.